Stock Low : 758 items left. 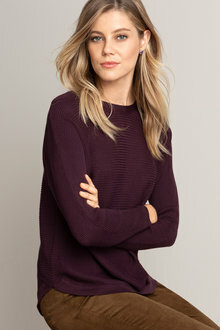 An everyday essential with a contemporary twist, the Capture Ribbed Batwing Sweater is designed with a curved hem, voluminous sleeves and is available in an offering of chic new season hues to complement all kinds of separates in your wardrobe. Spun from acrylic, it's durable and easy to care for making it perfect for regular wear, with an all-over ribbed knit to provide extra style points as well as comfort and ease of movement. Try this with a lightweight long-sleeved top, skinny jeans and chunky ankle boots or sneakers for busy weekends, finishing with a printed scarf and felt hat.